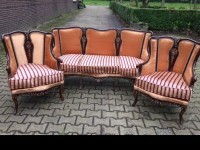 Amazing living room set made in Louis XVI style, sofa and 4 chairs. 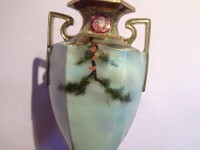 This set is made around 1920. 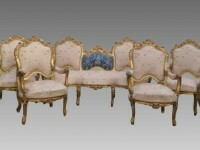 The complete set has been completely restorated and refurnished with a very lovely French fabric and gold leaf. This is a high quality set, ready for immediate day-to-day usage. The sitting is very relaxed and comfortable. 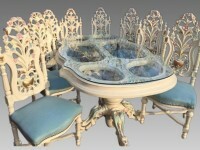 The wood is very solid, handmade craft works express the antique art of the French style. 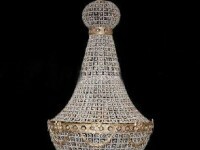 Your living room would look even more amazing having this items. Wide: 217 cm / 85,4 inch. High: 113 cm / 44,4 inch. Deep: 64 cm / 25 inch. (high from ground to seat 55cm/ 21,6 inch). Wide: 75 cm / 29,5 inch. Deep 64 cm / 25 inch. (high from ground to seat 55 cm/ 21,6 inch). 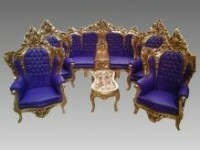 Price for the complete set = $ 5,700.00. 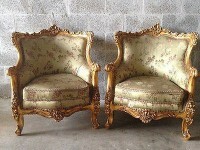 Price for sofa and 2 chairs = $ 4,200.00. 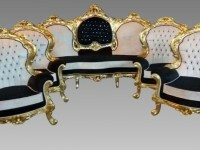 Price for sofa = $ 3,250.00. 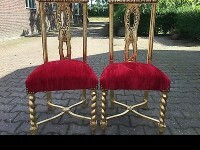 Price for 2 chairs = $ 1,950.00.